In the Northwest Suburb of Chicago on 8-25-17, I’m sharing a very special treat as we have a private tour with Elaine Silets, a woman known as “The Train Lady”. Today she shares her “station” she built that houses her model railroad. 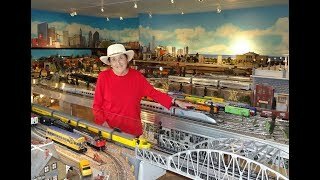 She has one of the most amazing / awesome O Scale / Gauge Model Railroad train layouts, and people come internationally to visit by appointment only, or when there is an open house for a charity event. The layout tours through Chicago and the surrounding suburbs.